As I begin to make small production runs of my ESY stool (pictured above) to fill an increase in demand, I’ve been enjoying sending them out into the world and seeing where they land. Last week I delivered a sample to the office suite of a commercial real estate developer, and left it in a conference room under construction, nestled amongst a cluster of elegant Danish chairs. The stool worked perfectly with the setting, which got me thinking about what makes for a kind of universal style, or a style of no style. In my experience, the style of no style is a consequence of Radical Pragmatism. I originally developed the stool as a minimalist seating solution for the Middle School Dining Commons associated with Alice Waters’ acclaimed Edible Schoolyard project. The stools stack up to 7 high, consist of just three repeated parts, and use a bare minimum of native, California hardwoods, traditionally joined into a lightweight but durable seat. The ESY stool doubles nicely as an occasional table. Most important, I prototyped and manufactured the original batch of 120 stools myself, and designed it around my minimal production capabilities, knowing I would need to keep costs down to compete with comparable products already in production. The stool is now made in small batches by a local shop, each batch sequenced with wood from the same sustainably milled logs. Sales have increased as the stool becomes available, and I look forward to scaling production in respect of the stool’s original ethos, eventually making it available on the Goods pages of this site. 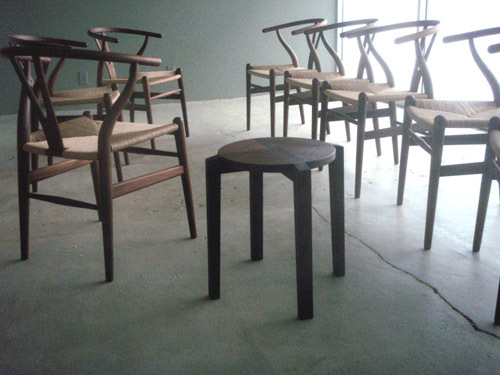 Posted by Scott on January 31st, 2010, at 6:46 pm, and filed under all, edible schoolyard, furniture design.